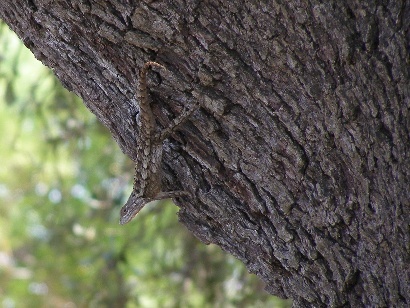 German settlers transmigrating from Fredericksburg began arriving in the early 1850s. These were joined by Irish immigrants in the middle of that decade. The towns namesake(s) were William and Minna Koock who opened a store in their log house just after the Civil War. Due to its proximity to Mason, the Koocks never saw the need to apply for a post office. Koock's store became a stop for cattle buyers from more western counties. The log store/ residence was rebuilt as a large stone structure in 1883. 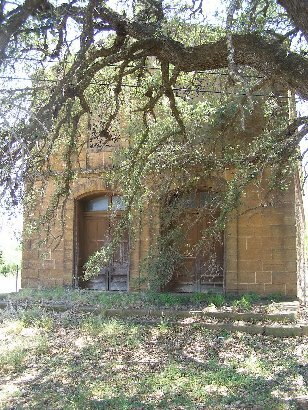 The building's second floor served as a community center and a place to hold civic meetings. The town thrived after the Civil War and the new prosperity made Koock a banker as well as a storekeeper. 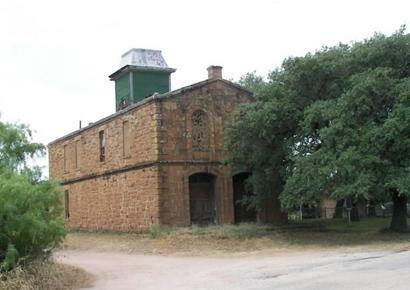 Koock later built a large flour mill and gin on his property but it was torn down and the stone cannibalized to build the VFD building in Mason. Koockville did have its own school at one point. A decline in cattle and sheep prices sent the town into a slump, but when William Koock was killed in a riding accident (1890) his family moved into Mason and eventually sold the businesses (1899). 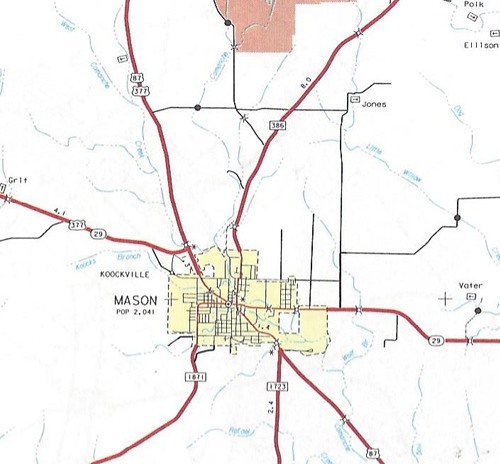 Without the driving force of William Koock, the town would have disappeared, but it's nearness to Mason has caused it to evolve into part of that city. Pioneers began to settle this locality in the 1850s. The oldest marked grave in Crosby Cemetery is dated 1856. 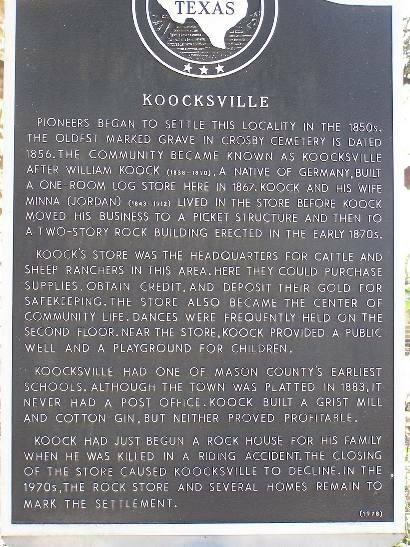 The community became known as Koocksville after William Koock (1838-1890), a native of Germany, built a one-room log store here in 1867. Koock and his wife Minna (Jordan) (1843-1912) lived in the store before Koock moved his business to a picket structure and then to a two-story rock building erected in the early 1870s. 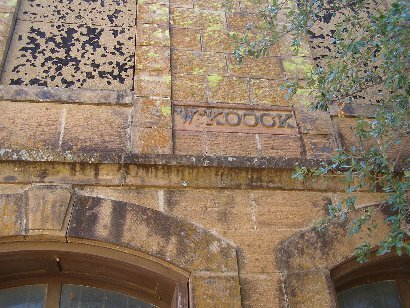 Koock's store was the headquarters for cattle and sheep ranchers in this area. Here they could purchase supplies, obtain credit, and deposit their gold for safekeeping. The store also became the center of community life. Dances were frequently held on the second floor. Near the store, Koock provided a public well and a playground for children. Koocksville had one of Mason County's earliest schools. Although the town was platted in 1883, it never had a post office. 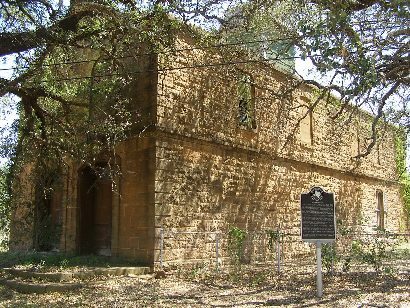 Koock built a grist mill and cotton gin, but neither proved profitable. Koock had just begun a rock house for his family when he was killed in a riding accident. The closing of the store caused Koocksville to decline. 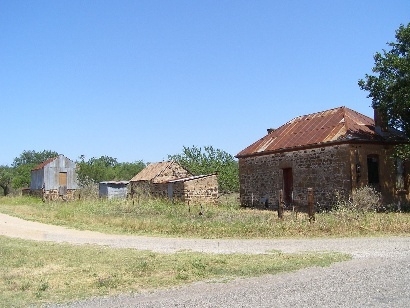 In the 1970s, the rock store and several homes remain to mark the settlement.